The aim of the shoulder hit is to take advantage of Black's low position and to keep them low and not gain any influence. If keeping the 3-3 stone down is not a huge concern, an approach at one of the marked points might be considered instead, depending on the situation on the board. The standard response to would be at a or b. The response at leaves some issues as far as I can see. A white play at b or c is obviously out of the question, as they would lead to instant bad results. The only decent response that I can see so far is for a white play at a.
I hope you don't mind my strong language here, but is a ripped keima, definitely a big no-no, allowing to split the two black stones. 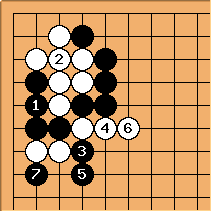 Now the two lone black stones are pressed against White's wall, and if Black tries to save either of the stones, he will hurt the other stone. My Weiqi coaches in my Weiqi Association have put this very strongly across to his students (I was one then), and I will reiterate it here again. 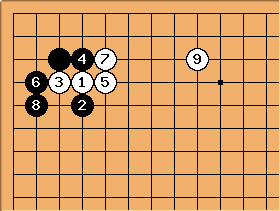 Moves you play should not cause your surrounding stones/groups to suffer. Make fewer such moves, and your strength will increase greatly. Charles At six good and six bad shapes, this is the first of the bad shapes. See the split shape page. PJTraill: Also known as ripped keima in l’ame du Go by Fan Hui. I understand the general principle described above, but I was also under the impression that you can always break principles if you have a reason. My reasons for breaking this basic tenet are as follows. Perhaps they are faulty reasons, I don't know. One, forces - all other responses allow Black to connect which is no fun for White. Two, the 3-3 stone by nature of its position is still fairly stable, so the splitting move only creates one weak group. Three, the shoulder hit on the 3-3 stone is a move that allows your opponent profit in exchange for influence. 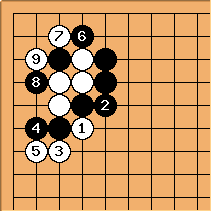 Because is forcing, it allows Black to choose the direction in which White's wall faces. In certain situations, Black may be able to point White's wall into an area where it is of little use, say facing a secure black group. In this case would be a forcing move, so it may be treated lightly. If this stone inevitably suffers, that is not necessarily a bad thing. If people blindly follow the rule that "no move you make should cause your surrounding stones to suffer" no one would every sacrifice stones for a greater gain. Four, as play continues, the positioning of requires White to uses a bit of caution. 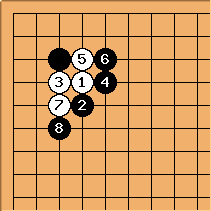 Five: because White splits Black's stones, she may assume automatically that Black does not know what he is doing and underestimate the situation. Regardless of whether or not is inevitably a bad move or not, I think it at least warrants consideration as a trick play so you do not fall into a trap. Is Black 2 a big no-no? 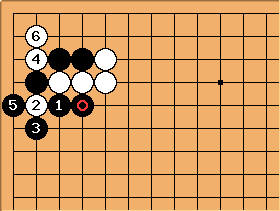 It seems to me that Black can force this sequence. My thinking is that this could be a favorable position in some situations. White following up with tenuki would be a risky proposition because Black a threatens to rescue and brings Black's position up to the fourth line at the same time. Depending on the circumstances, the threat of Black a could allow Black to end in sente. To leave this position, White may have to play at a. White could play at b as well, depending on the surrounding situations and whether a cut at a could cause some complications. 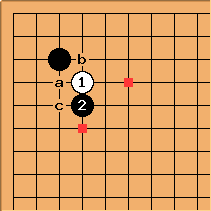 Aside from this, Black has had the advantage of picking the direction of the wall, and may be able to use the threat of rescue to complete the sacrifice of in some meaningful way. This is the original sequence suggested by BlueWyvern. This is a joseki. More often than not, there is a white stone at around a. The only difference between the two variations is the position of . In Variation 1, is totally useless - it has no value remaining at all. 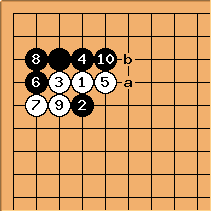 In Variation 2, still has the chance to perform counter-attacks at b or c (even with the presence of a white stone around a), so it may be necessary for White to defend at d at a later stage of the game. This proves that Black playing at in Variation 1 is not good. BillSpight: Divide and conquer is a good rule. invites , severely dividing Black. In your original diagram each player has made two plays. Suppose White had gone first, as here. After would Black play at ? Anonymous: This reverses the order of play and gives white sente - this diagram is absolutely terrible for black. 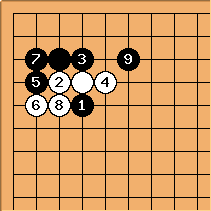 In go, the closer together the two stones that are divided, the more severe the play that divides them (small gaps). Here you have the most severe division possible. You want your stones to work together. Here they cannot co-operate very well. There is a further problem with your suggested variations. White does not need to answer the hane of , but can play the magari . After - , Black is too low, and is obviously poorly placed. After , White can cut with . 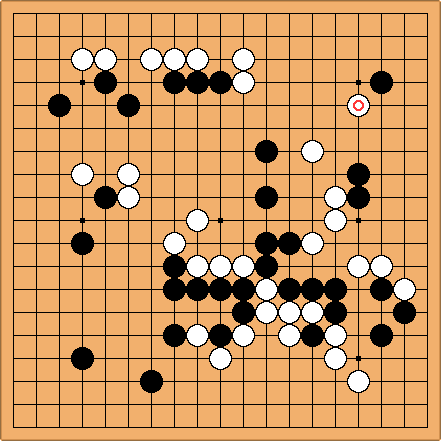 White takes the corner and is still inefficient. 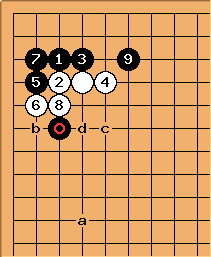 Kato Masao (Black) against Fujisawa Shuko. White has just played . What is Black's next play? Sorry, I saw this today in Kato's Chuban Sen no Koubou on the subway going to work and couldn't resist! This is very funny, Dave - it just goes to show that your plays always have to take the global situation into account. The only thing you have to remember is to try to make the trades favourable to yourself, or as Go Seigen said 'Give a little, take a lot..' This is my favourite proverb, because it is the only one that can be applied in all situations on the Go Board! Bob Myers: This position does lead to some interesting hamete. I myself went through a period of playing here. The key follow-up is . Self-study question: What is White's alternative for ? ?